Editor’s Note: There are few names as legendary in Eve writing than that of Ripard Teg in his blog, Jester’s Trek. Love him or hate him, you almost certainly read what he wrote and had an opinion one way or the other. We’re delighted that he’s dusted off his virtual pen for the first time in years to write for us here at CZ. You can read the first of this two-part series here. So. Say you’re Goonswarm. You’ve got allies, but you’ve managed to drive some of them off – implying that they’re mentally handicapped in the process. They’re telling your secrets to your enemies. Those enemies are invading. In the meantime, you’re also being invaded from three or four other sides at once, and virtually every major power in the game is kicking at your door. They’re all blue to each other. Hell, you’ve managed to make so much of New Eden angry that even Provibloc has declared war on you and is invading! What happens now? As with part one of this piece, in this part two, I’m going to again focus on the big picture. Who is going to be holding sov in Fade in six months? I haven’t got a clue. Will The Imperium win? I don’t know that either. But I am going to focus on what happens next both in the short term and in the long. Ready? Here goes. I’m going to start by invoking my one and only World War II analogy of this piece, and it has almost nothing to do with World War Bee, I promise. On 22nd June 1944, the Soviet Union launched Operation Bagration, their invasion of White Russia, Poland, and ultimately Germany, three years to the day after the German Operation Barbarossa which launched the German invasion of the Soviet Union. The common factor in these two invasions (besides the date) was the fact that they were mirror images of each other. The 1941 invasion introduced the Soviet army to the blitzkrieg style of the German military: concentrated armor operating under a withering rain of aircraft and artillery strikes falling on relatively static troops too married to defending fixed positions who were given “hold or die” orders. The 1944 counter-invasion was its mirror duplicate in virtually every respect. The Germans were even given the same “hold or die” orders that were so fatal to Stalin’s troops three years earlier. The Russians had three years of schooling from the German army, you see, and had learned their lessons truly and well. They turned those lessons against their enemies. Want to really annoy Goonswarm leaders? Use their own tactics against them. There is nothing so ironic on this planet or any other as the image of The Mittani on his most recent Meta Show complaining that The Imperium is being blobbed. But it’s a terrific example of something that every ally attacking The Imperium has in common. From NCdot to Test Alliance to Provibloc to the members of Low-Sec Voltron, all of us have experienced their tactics first-hand – for years – and we’re finally not above stealing what works. If anyone in The Imperium tells you this doesn’t scare them, they’re lying their asses off. Something that The Imperium has always excelled at is their flexibility in battle: they rapidly shift tactics on you, making it hard to respond effectively. You’re trying to counter-punch their last punch, meanwhile, they’ve changed their attack dramatically, leaving you flat-footed. The allies of the Money Badger Coalition – I’m not a fan of this name, but it seems we’re stuck with it – demonstrated this ably when we conquered the UMI-KK station. Declaring he was no longer going to fight fair, The Mittani came at us collectively with massed groups of interceptors supported by Drake and T3D Entosis ships and bombers. The MBC, meanwhile, had formed Voltron and were responding not-particularly-effectively with a massed Proteus fleet. The Proteus ball just wasn’t responding well to the interceptor distraction, allowing enemy Drakes to Entosis in peace in a half-dozen systems. Rather than sticking to a strategy that wasn’t working, our fleet commanders ordered a split into our respective alliance fleets, each alliance ordered to hold one or two systems of the nine-system constellation of X-VN63. Staying together as Voltron wasn’t working, so we split back into lions. The Red Lion of Snuffed Out (I don’t claim we’re the head, but with our discipline, skill, deep FC bench, and broad time zone coverage, we’re definitely the sword arm) was assigned NL6V-7 and GKP-YT. We defended our two systems, crushed eight or ten Drakes trying to Entosis in our area, swatted a pesky bomber ball, and when four nodes opened in GKP – enough to finish the job – it was Snuffed Out who called the lions back together to reform Voltron in that system. The Imperium’s fleet wasn’t able to respond effectively to this mid-battle change in tactics. UMI’s fall was the consequence. Flexible tactics? Keeping a large group of blues together under diplomatic tensions? Coordinating them to use supporting doctrines? Big blobby fleets that break up into components, find targets, then blob back up for the set-piece battle? Ability to cover all three EVE time zones? Striking hard with a solid front while rear echelon troops harass behind enemy lines with cloaky campers? Patient discipline to hit one system after the next without overreaching? Uncatchable sov lasers or unjammable sov lasers? All of these tactics are The Imperium’s thing. Striking for and cutting off enemy staging systems? Definitely The Imperium’s thing. Oh my yes, the MBC has learned The Imperium’s lessons, and learned them well. The fact that The Mittani is sounding a little ragged and telepromptery lately isn’t a coincidence. The Imperium’s leadership has never had to face an enemy quite so much like them before, and they’re finding they don’t care for it. The fact that their narrative is swinging toward “There is no way MBC can stay together” and “They’re gonna get bored” and “Who wants to hold sov anyway?” also isn’t a coincidence. If anyone in The Imperium tells you this doesn’t scare them, they’re lying their asses off about that, too. So, short term big picture? It’s looking really good for the Money Badger Coalition. 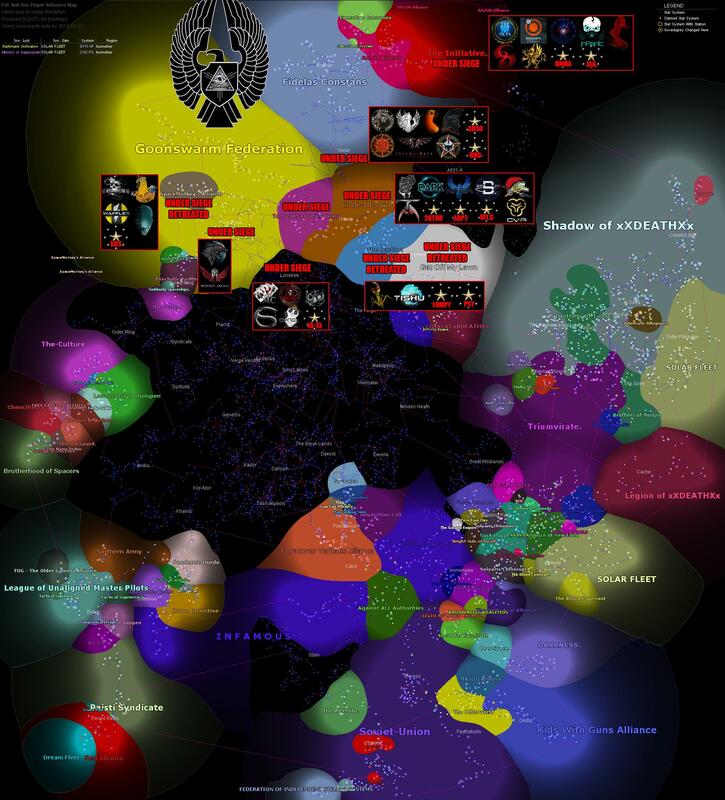 The Imperium’s alliances are bleeding members, four regions are effectively captured, and MBC forces are advancing to hit Branch, Pure Blind, and Deklein. For the first time ever, YA0-XJ is in easy striking distance of a station held by the enemies of The Imperium. Let’s look longer term and even bigger picture. What do the summer of 2013, March of 2014, and the summer of 2015 have in common? (a) All of them were time periods in which The Imperium won major wars against their enemies. (b) All of them were time periods in which the number of people playing EVE dropped off a cliff. You guessed it. The answer is (c). In the early summer of 2013, The CFC conquered the Honey Badger Coalition in the much-ballyhooed Fountain War. 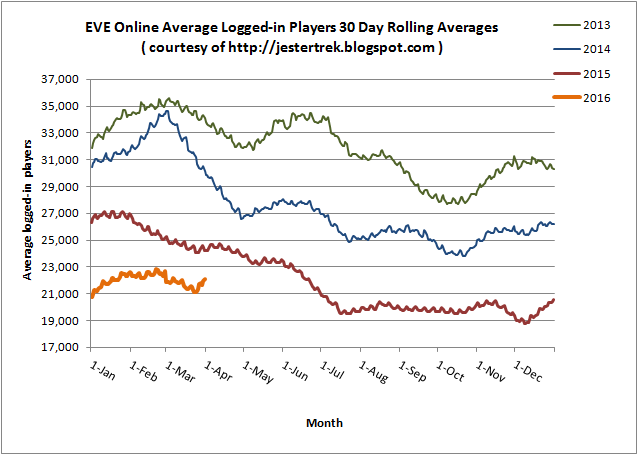 Shortly thereafter, logged-in players in EVE fell 12%. Things improved that autumn – more on this in a second – but in March 2014, the stunning CFC victory in B-R5RB resulted in EVE logged-in player counts cratering by almost 25%. The summer of 2015 marked The Imperium’s invasion of Provibloc, the net result of which was four or five days of chaos followed by another 10% drop of logged-in players. What do October 2013, February 2014, and April 2016 have in common? (a) All of them were time periods in which The Imperium was coming under major attack or lost significant conflicts. (b) All of them were time periods in which the number of people playing EVE climbed dramatically. Wow, you’re good at this. Yep, (c) again. October 2013 marked the Halloween War, a significant CFC loss. It resulted in an 11% spike in logged-in players. February 2014 marked the run-up to the CFC’s conflict against RUS and Pandemic Legion. It still marks one of the biggest spikes in logged-in players in EVE’s history, a 13% spike in 45 days which also corresponded with the greatest increase in new player subscriptions CCP has ever seen before or since. The current spike in logged-in players is about 9% and is still growing. Every alliance in EVE – Imperium and Money Badger members both – are welcoming back long-lapsed players. For the first time in almost a year, EVE is looking positively healthy and vibrant! We’re getting positive buzz from gaming sites and we were trending on Facebook the other day. New player sign-ups are spiking well and though we are not yet on a February 2014 pace, the trend is unmistakable. The EVE sub-reddit is full of new players asking questions. 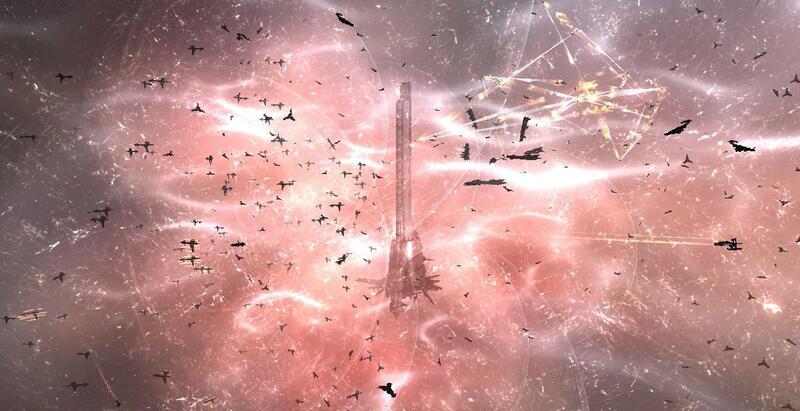 EVE Online is once again getting some much-needed attention from the outside world. The conclusion is nearly inescapable: when The Imperium wins wars, EVE players unsubscribe en masse. Imperium members unsub super-capital alts and line members unsub because they lack a significant challenge. The alliances crushed by The Imperium lose members, or collapse entirely, players unsubbing in disgust over a blue doughnut which they have no ability to effectively attack. When The Imperium starts losing, the lapsed on both sides return to the flock and EVE enjoys a Renaissance. The more likely it seems that the baddies will lose, the greater the spike. My friends in The Imperium are convinced that any loss they suffer will be the death knell of EVE. I’m sympathetic. But the evidence doesn’t support that position. War is invariably good for business, and not just for the participants. Doing industry in EVE in 2015 was a horrible experience: where is the motivation to build anything when nothing in this game explodes? PvE? Nearly as bad. What’s the point of doing yet another escalation when the product of the BPC or the faction mod that drops won’t sell? CCP Fozzie has been cheering over breaking PvP record after PvP record the last week or two. This is good for the PvPers, of course, but the goodness flows downhill to industry and PvE-minded players as well. So looking at the big picture longer term, I see three possibilities. Option 1: The Imperium wins World War Bee. This can only be realistically regarded as a worst case scenario. If The Imperium wins this one, at best we can expect a return to the quiet doldrums of late 2015. At worst, we can expect another post B-R situation. After B-R, with no challenges for either side and the failed CCP marketing push for a great war that never really happened, EVE players (both Goons and non-Goons) unsubbed en masse. The Mittani obviously wants this outcome, but if he gets it, how will the Goons avenge themselves on unsubbed players who have no sov and no assets in space to destroy? EVE would probably survive, but would continue to be Space Ultima Online. CCP, meanwhile, would definitely turn their full attention, marketing, and goodwill to Valkyrie and Gunjack. Option 2: A bloody stalemate rages for months until the autumn drop. Every November, EVE players traditionally turn away from EVE for school finals, the holidays, and other pursuits. It’s hard to imagine World War Bee surviving that, so if the conflict turns into a stalemate, we’ll be seeing epilogues for this war in six months or so. Those six months will be a bright spot in the history of EVE, no question! But from a standpoint of the health of the game, this option is not particularly desirable. A split decision would not attract many new players for long and would be difficult or impossible for CCP to market. “Get out there and maintain the status quo!” is hardly inspiring. Option 3: The Imperium loses World War Bee. New Eden becomes a whole new world. It’s hard to imagine a total Imperium loss. More likely, I can imagine a significant contraction, Goonswarm choosing a few much-trusted allies to hold a fraction of their current space, but hold that in near-impregnable fashion under a web of strong citadels. Still, can you imagine the joy in Reykjavik? Not over The Imperium losing… over the marketing possibilities. For only the third time in the history of New Eden, an unstoppable, unbreakable coalition will have been stopped, will have been broken. It would be a landmark event in the history of the game. For a time, cynicism would reign over the former Imperium players, but that wouldn’t last. As I said at the top of part one, Goonswarm is too accomplished, its leaders too strong, its members too dedicated to stay down long. So best possible outcome: Goons lose, they’ll almost certainly stay subscribed, and launch (at some point) a brutal foreverwar of vengeance to either take back their space or wreak revenge havoc on someone. Goons will stay subbed, everyone else will stay subbed, and we’ll have content for a good long while, certainly the next year or more! Sov across the north and west and south will open to new alliances and existing alliances that have never imagined themselves as sov-holders. That will attract a lot of new players. So not only will EVE Online keep the players we have, we may very well recover to where we were in 2012-2013. I can imagine no brighter future for EVE Online. During their messaging push for their Fountain War Kickstarter book, The Mittani and other Goonswarm leaders claimed that they wanted nothing more than the health of the game. If that’s true, the best thing they can do is lose World War Bee. Will they? Well, Mittens would remind us here that wars are about hatred and vengeance. The Money Badger Coalition definitely has that. Author of the legendary Jester's Trek blog (RIP) and former CSM member.